Augustus Saint-Gaudens (/ˌseɪntˈɡɔːdənz/; March 1, 1848 – August 3, 1907) was an American sculptor of the Beaux-Arts generation who embodied the ideals of the American Renaissance. Raised in New York City, he traveled to Europe for further training and artistic study, and then returned to New York, where he achieved major critical success for his monuments commemorating heroes of the American Civil War, many of which still stand. In addition to his works such as the Robert Gould Shaw Memorial on Boston Common, and the outstanding grand equestrian monuments to Civil War Generals, John A. Logan in Chicago's Grant Park, and William Tecumseh Sherman, at the corner of New York's Central Park. Saint-Gaudens also created Classical works such as the Diana, and employed his skills in numismatics. Most notably, he designed the $20 "double eagle" gold piece (1905–1907) for the US Mint, considered one of the most beautiful American coins ever issued as well as the $10 "Indian Head" gold eagle, both of which were minted from 1907 until 1933. In his later years he founded the "Cornish Colony", an artistic colony that included notable painters, sculptors, writers, and architects. His brother Louis Saint-Gaudens, with whom he occasionally collaborated, was also a well-known sculptor. Saint-Gaudens was born in Dublin to a French father, Bernard Paul Ernest Saint-Gaudens, a shoemaker by trade from a small village in the French Pyrenees, Aspet, 15 kilometers from Saint-Gaudens, and an Irish mother. He was raised in New York after his parents immigrated to America when he was six months of age. In 1861, he became an apprentice to a cameo-cutter, Louis Avet, and took evening art classes at the Cooper Union in New York City. Two years later, he was hired as an apprentice of Jules Le Brethon, another cameo cutter, and enrolled at the National Academy of Design. At age 19, his apprenticeship was completed and he traveled to Paris in 1867, where he studied in the atelier of François Jouffroy at the École des Beaux-Arts. In 1870, he left Paris for Rome to study art and architecture, and worked on his first commissions. There he met a deaf American art student, Augusta Fisher Homer, whom he married on June 1, 1877. The couple had one child, a son named Homer Saint-Gaudens. In 1874, Edwards Pierrepont, a prominent New York reformer, hired Saint-Gaudens to create a marble bust of himself. Pierrepont, a phrenologist, proved to be a demanding client, insisting that Saint-Gaudens make his head larger. Saint-Gaudens said that Pierrepont's bust "seemed to be affected with some dreadful swelling disease" and he later told a friend that he would "give anything to get hold of that bust and smash it to atoms". In 1876, he won a commission for a bronze David Farragut Memorial. He rented a studio at 49 rue Notre Dame des Champs. Stanford White designed the pedestal. It was unveiled on May 25, 1881, in Madison Square Park. He collaborated with Stanford White again in 1892–94 when he created Diana as a weather vane for the second Madison Square Garden building in New York City; a second version used is now in the collection of the Philadelphia Museum of Art, with several reduced versions in museums including the Metropolitan Museum of Art in New York City. The statue stood on a 300-foot-high tower, making Diana the highest point in the city. It was also the first statue in that part of Manhattan to be lit at night by electricity. The statue and its tower was a landmark until 1925 when the building was demolished. The commissions followed fast, including the colossal Standing Lincoln in Lincoln Park, Chicago in a setting by architect White, 1884–1887, considered the finest portrait statue in the United States (a replica was placed at Lincoln's tomb in Springfield, Illinois, and another stands in Parliament Square, London), and a long series of memorials, funerary monuments and busts, including the Adams Memorial, the Peter Cooper Monument, and the John A. Logan Monument. Arguably the greatest of these monuments is the bronze bas-relief that forms the Robert Gould Shaw Memorial on Boston Common, 1884–1897, which Saint-Gaudens labored on for 14 years; even after the public version had been unveiled, he continued with further versions. Two grand equestrian monuments to Civil War generals are outstanding: to General John A. Logan, atop a tumulus in Chicago, 1894–1897, and to William Tecumseh Sherman at the corner of Central Park in New York, 1892–1903, the first use of Robert Treat Paine's pointing device for the accurate mechanical enlargement of sculpture models. The depictions of the African-American soldiers on the Shaw memorial is noted as a rare example of true-to-life, non-derogatory, depictions of Afro-ancestral physical characteristics in 19th-century American art. 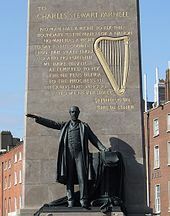 Saint-Gaudens also created the statue for the monument of Charles Stewart Parnell, which was installed at the north end of Dublin's O'Connell Street in 1911. In 1887, when Robert Louis Stevenson made his second trip to the United States, Saint-Gaudens had the opportunity to make the preliminary sketches for a five-year project of a medallion depicting Stevenson, in very poor health at the time, propped in bed writing. With minor modifications, this medallion was reproduced for the Stevenson memorial in St. Giles' Cathedral, Edinburgh. Stevenson's cousin and biographer, Graham Balfour, deemed the work "the most satisfactory of all the portraits of Stevenson". Balfour also noted that Saint-Gaudens greatly admired Stevenson and had once said he would "gladly go a thousand miles for the sake of a sitting" with him. Saint-Gaudens was also commissioned by a variety of groups to create medals including varied commemorative themes like The Women"s Auxiliary of the Massachusetts Civil Service Reform Association Presentation Medal and the World's Columbian Exposition Medal. Such pieces stand testament to both his broad appeal and the respect that was given to him by his contemporaries. A statue of philanthropist Robert Randall stands in the gardens of Sailors' Snug Harbor in New York. A statue of copper king Marcus Daly is at the entrance of the Montana School of Mines on the west end of Park St. in Butte, Montana. A statue of former United States Congressman and New York Governor Roswell Pettibone Flower was dedicated in 1902 in Watertown, New York. 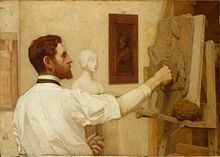 Through his career Augustus Saint-Gaudens made a specialty of intimate private portrait panels in sensitive, very low relief, which owed something to the Florentine Renaissance. 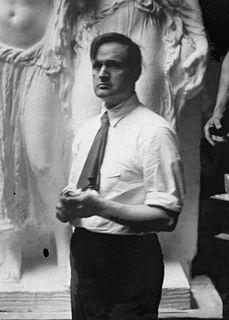 It was felt he heavily influenced another Irish American sculptor, Jerome Connor. Chosen by Theodore Roosevelt to redesign the coinage of the nation at the beginning of the 20th century, Saint-Gaudens produced an ultra high-relief $20 gold piece that was adapted into a flattened-down version by the United States Mint. The ultra high-relief coin took up to 11 strikes to bring up the details, and only 20 or so of these coins were minted in 1907. The Ultra High Reliefs did not stack properly and were deemed unfit for commerce. They are highly sought-after today; one sold in a 2005 auction for $2,990,000. The coin was then adapted into the High relief version, which, although requiring eight fewer strikes than the Ultra High Relief coins, was still deemed impractical for commerce. 12,317 of these were minted, and are currently among the most in-demand U.S. coins. The coin was finally modified to a normal-relief version, which was minted from 1907 to 1933. Diagnosed with cancer in 1900, Saint-Gaudens decided to live at his Federal house with barn-studio set in the handsome gardens he had made, where he and his family had been spending summers since 1885, in Cornish, New Hampshire – though not in retirement. Despite waning energy, he continued to work, producing a steady stream of reliefs and public sculpture. In 1901, he was appointed a member of the Senate Park, or McMillan, Commission for the redesign of Washington, D.C.'s Mall and its larger park system, along with architects Daniel Burnham and Charles Follen McKim, and landscape architect Frederick Law Olmsted, Jr.; in 1902, the Commission published their report, popularly known as the McMillan Plan. In 1904, he was one of the first seven chosen for membership in the American Academy of Arts and Letters. That same year the large studio burned, with the irreplaceable loss of the sculptor's correspondence, his sketch books, and many works in progress. During World War II the Liberty ship SS Augustus Saint-Gaudens was built in Panama City, Florida, and named in his honor. In 1940, the U.S. Post Office issued a series of 35 postage stamps, 'The Famous American Series' honoring America's famous artists, poets, educators, authors, scientists, composers and inventors. The renowned sculptor Augustus Saint-Gaudens was among those chosen for the 'Artists' category of this series and appears on this stamp, which was first issued in New York City on September 16, 1940. Josiah Gilbert Holland monument, Springfield Cemetery, Massachusetts (1881). Caffin, Charles H. (February 1904). "The Work of the Sculptor August Saint-Gaudens". The World's Work: A History of Our Time. VII: 4403–4419. Retrieved 2015-05-16. Kvaran, Einar Einarsson, St. Gaudens' America, unpublished manuscript. Podas Larson, Christine, St. Gaudens' New York Eagle: Rescue And Restoration Of St. Paul's First Outdoor Sculpture, Ramsey County History Quarterly V37 #3, Ramsey County Historical Society, St Paul, MN, 2002. Taft, Lorado: The History of American Sculpture Publisher: MacMillan Co., New York, NY 1925. Tripp, David, "Fear and Trembling" & Other Discoveries: New Information on Augustus Saint-Gaudens and America's Most Beautiful Coin", ANS Magazine 6/1 (Winter 2007). ^ "The Education of Henry Adams: Chapter XXII. Chicago (1893) by Henry Adams @ Classic Reader". www.classicreader.com. ^ "Saint-Gaudens National Historic Site". Archived from the original on 21 January 2013. Retrieved 23 June 2013. ^ Finn, Burke Wilkinson ; photographs by David (1985). Uncommon clay : the life and works of Augustus Saintules Le BrethenGaudens (1st ed.). San Diego: Harcourt Brace Jovanovich. pp. 13–16. ISBN 0151927499. ^ Finn, Burke Wilkinson ; photographs by David (1985). Uncommon clay : the life and works of Augustus Saintules Le BrethenGaudens (1st ed.). San Diego: Harcourt Brace Jovanovich. p. 16. ISBN 0151927499. ^ David McCullough (Fall 2011). "Adventures in Paris". American Heritage. 61 (2). p. 40. ^ David McCullough (Fall 2011). "Adventures in Paris". American Heritage. 61 (2). p. 41. ^ a b c "Judge Edwards Pierrepont". Smithsonian American Art Museum and the Renwick Gallery. Retrieved 2016-02-25. ^ David McCullough (Fall 2011). "Adventures in Paris". American Heritage. 61 (2). p. 44. ^ David McCullough (Fall 2011). "Adventures in Paris". American Heritage. 61 (2). p. 48. ^ List primarily gleaned from Wilkinson, Burke, Uncommon Clay: The Life and Works of Augustus Saint Gaudens, photographs by David Finn, Harcourt Brace Jovanovitch, Publishers, San Diego, 1983. ^ Civic Art: A Centennial History of the U.S. Commission of Fine Arts, ed. Thomas E. Luebke. Washington, D.C.: U.S. Commission of Fine Arts, 2013. Wikimedia Commons has media related to Augustus Saint-Gaudens. 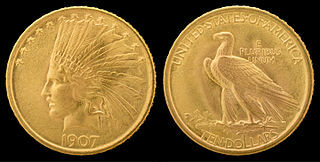 A double eagle is a gold coin of the United States with a denomination of $20. The coins are made from a 90% gold and 10% copper alloy and have a total weight of 1.0750 troy ounces. Adolph Alexander Weinman was a German-born American sculptor and architectural sculptor. James Earle Fraser was an American sculptor during the first half of the 20th century. His work is integral to many of Washington, D.C.'s most iconic structures. The history of sculpture in the United States begins in the 1600s "with the modest efforts of craftsmen who adorned gravestones, Bible boxes, and various utilitarian objects with simple low-relief decorations." American sculpture in its many forms, genres and guises has continuously contributed to the cultural landscape of world art into the 21st century. Bela Lyon Pratt was an American sculptor. Saint-Gaudens National Historical Park in Cornish, New Hampshire, preserves the home, gardens, and studios of Augustus Saint-Gaudens (1848–1907), one of America's foremost sculptors. This was his summer residence from 1885 to 1897, his permanent home from 1900 until his death in 1907, and the center of the Cornish Art Colony. There are two hiking trails that explore the park's natural areas. Original sculptures are on exhibit, along with reproductions of his greatest masterpieces. It is located on Saint-Gaudens Road in Cornish, 0.5 miles (0.80 km) off New Hampshire Route 12A. Mary Lawrence (Tonetti) (1868–1945) was an American sculptor. She designed the Christopher Columbus sculpture at the World's Columbian Exposition. 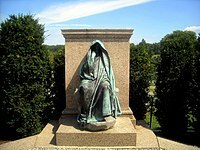 The Adams Memorial is a grave marker located in Section E of Rock Creek Cemetery, Washington, D.C., featuring a cast bronze allegorical sculpture by Augustus Saint-Gaudens. The shrouded figure is seated against a granite block which forms one side of a hexagonal plot, designed by architect Stanford White. Across a small light-toned granite plaza, a comfortable stone bench invites visitors to rest and meditate. The whole is sheltered by a close screen of dense conifers, more dense and uniform in 2015 than in the photograph to the right. Abraham Lincoln: The Man is a larger-than-life size bronze statue of Abraham Lincoln, the 16th president of the United States. The original statue is in Lincoln Park in Chicago, and several replicas have been installed in other places around the world. Completed by Augustus Saint-Gaudens in 1887, it has been described as the most important sculpture of Lincoln from the 19th century. At the time, the New York Evening Post called it "the most important achievement American sculpture has yet produced." Abraham Lincoln II, Lincoln's only grandson, was present, among a crowd of 10,000, at the unveiling. The artist later created the Seated Lincoln sculpture in Chicago's Grant Park. Burt William Johnson was an American sculptor. Abraham Lincoln: The Head of State is a 9-foot (2.7 m) tall bronze statue of Abraham Lincoln in Grant Park, in Chicago. Created by Augustus Saint-Gaudens and completed by his workshop in 1908, it was intended by the artist to evoke the loneliness and burden of command felt by Lincoln during his presidency. The sculpture depicts a contemplative Lincoln seated in a chair, and gazing down into the distance. The sculpture is set upon a pedestal and a 150-foot (46 m) wide exedra designed by architect Stanford White. The Indian Head eagle was a $10 gold piece or eagle struck by the United States Mint continuously from 1907 until 1916, and then irregularly until 1933. The obverse and reverse were designed by sculptor Augustus Saint-Gaudens, originally commissioned for use on other denominations. He was suffering from cancer and did not survive to see the coins released. The Puritan is a bronze statue by sculptor Augustus St. Gaudens in Springfield, Massachusetts, United States, which became so popular it was reproduced for over 20 other cities, museums, universities, and private collectors around the world, and later became an official symbol of the city, emblazoned on its municipal flag. Originally designed to be part of Stearns Square, since 1899 the statue has stood at the corner of Chestnut and State Street next to The Quadrangle. Diana – also known as Diana of the Tower – is an iconic statue by sculptor Augustus Saint-Gaudens. Once a famous New York City landmark, the second version stood atop the tower of Madison Square Garden from 1893 to 1925. Since 1932, it has been in the collection of the Philadelphia Museum of Art. Admiral David Glasgow Farragut, also known as the Admiral Farragut Monument, is an outdoor bronze sculpture of David Farragut by sculptor Augustus Saint-Gaudens on an exedra designed by architect Stanford White, located in Madison Square in Manhattan, New York. The statue, cast in 1880 and dedicated on May 25, 1881, is set on a Coopersberg (Pennsylvania) black granite pedestal.